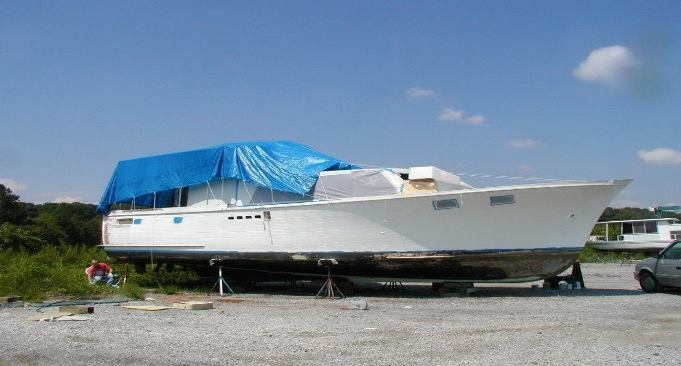 43’ with a 12’ beam Mahogany Yacht in need of saving! The bonus to this fine old boat is; I have all of the original documentation for this boat. It comes with documentation from the original commission and design to purchase. I also have her original US Coast Guard paperwork. There is tons of paperwork and original maintenance manuals and service records from the original owners. She is a wonderful Old Girl that has a Stateroom with head and shower, large main saloon and vbirth with a second head and shower and a Galley area. been bench started before being set back in and attached to her Allison transmissions. I have reworked the interior floor the original deck fittings have all been removed and stored along with most of the original bright work. I had all new glass cut for her and some has been installed. I purchased several board feet of hand cut Mahogany to repair a few soft spots and never did. I also still have the original glass as well as the solid Brass portholes, helm station with wheel and gauges. All I want is for her to have a new home and to see her enjoyed again. This boat is special to me. I purchased it after returning from Iraq with the dreams of freely cruising, but I am unable. I had every intention of restoring and putting her back in service. I hope you can save her and see her finished. 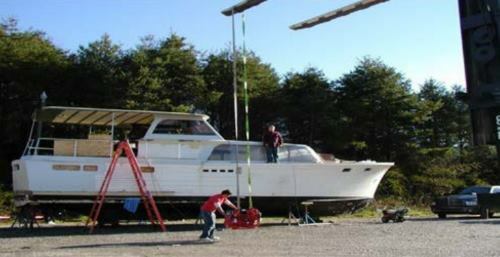 and will require a large transport vehicle with a yacht trailer.